The Wilmington real estate market can be very competitive. Sometimes a good cleaning and well-thought-out price aren’t the only things needed to get a home sold. While the number of bedrooms and baths, square-footage, and lot size are factored into choosing a home to purchase, let’s be honest, they aren’t the deciding factors. There are plenty of houses that fit the general criteria a buyer is looking for (“3 bedrooms, 2 baths, a 2 car garage, etc.”). Most buyers are shopping for their next home and a home isn’t floor plan. 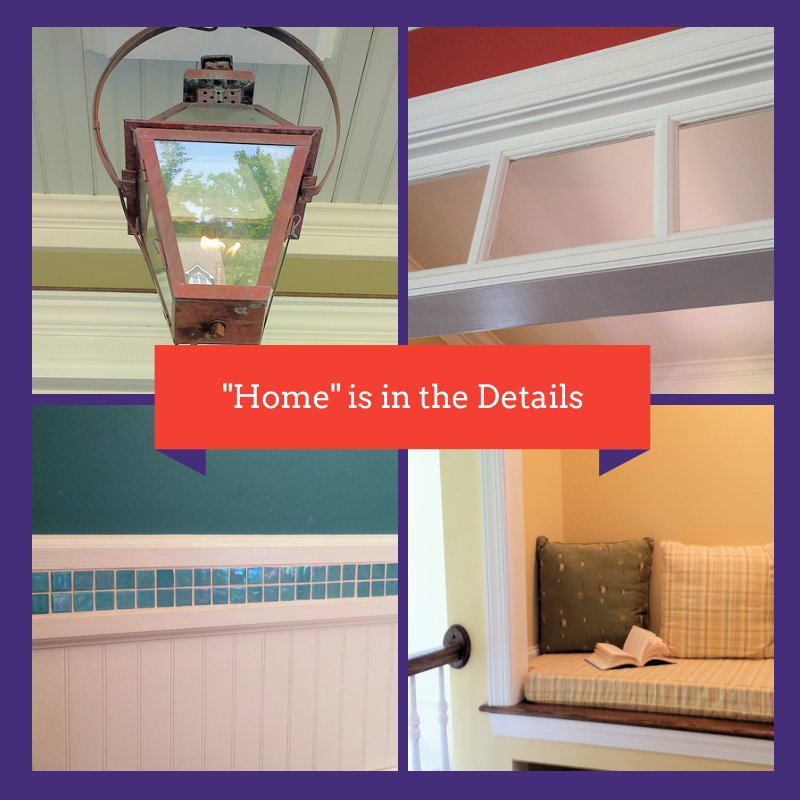 It’s the details that make a property a “home”. Perhaps, the buyer likes the idea of being greeted by the gas lantern over the front door, curling up with a book in the reading nook, seeing the color of the bathroom tile every morning, or enjoying the feeling the transom windows incite in them whenever they enter the home. These little things are what make a buyer imagine themselves living in the home. It’s also what makes them decide they may not need a certain feature, because the one your home has is more appealing. It goes without saying that one of the keys to getting a property sold is making it stand apart from other listings in the same neighborhood. That can be done by investing in unique details. Now, this doesn’t mean paying for expensive upgrades or adding odd features, like the indoor playhouse you saw on Pinterest. Matter-of-fact, that could make the home harder to sell. Instead, it means truly analyzing the features of the home, highlighting the best ones, and tweaking any that are outdated. If your home is in need of some updating and you’re on a limited budget, sometimes it’s better to take one home project and do it really well than spread out your money all over the house. History has shown that you’ll get the biggest bang for your buck by focusing on the kitchen and bathrooms. If your home was built in the ‘90s and your kitchen hasn’t been updated at all, simply painting the cabinets and replacing the hardware with a newer finish may be all you need to do to make it stand out. Another example may be stained or broken bathroom tile. A bathroom in poor shape can be a kill-all for a sale, and it may be well worth the investment to replace or refinish the tile, depending on the price range of the property. Prior to listing your home for sale, we suggest contacting a Wilmington Realtor to find out what’s been selling in the neighborhood. Pictures, virtual tours, and the Realtor’s own experiences will give you the best idea of what current features and potential features could give you a leg-up on other listings. It’s hard to make changes to a home and properly advertise it once the home is on the market, because a lot of systems rely on automated syndication that can take some time to update after they’ve already fed. So, it’s best to get your home shining prior to listing. If you need help preparing your Wilmington area home for sale, give us a call or send us a message through our Contact page, and remember – “home” is in the details.